June's update brings you two marquetry pieces which are not this time from the Buchschmid and Gretaux stable. These appear to be from very different areas of this world. Have a look and see if you can identify their origins and perhaps their makers, and then we hope you will get in touch with us and let us know your thoughts on them. Our June update features two unusual marquetry themed pieces we think you will find interesting. 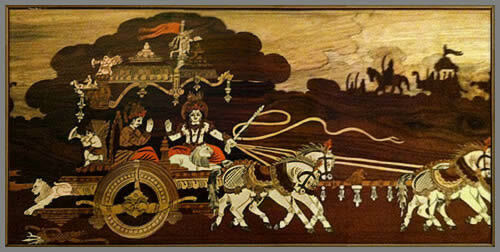 The top piece appears to be some sort of marquetry triptych decorated with an intricate pierced background pattern. We think it has a sort of Spanish or Puerto Rico stylistic appearance to it. The themes of the oval pictures seem to bear this supposition out. The dimensions are about 26 x 42 cm with the leaves unextended. If you have any ideas could you help us out with what you think it could be, thanks. The next piece is this Oriental / Arabian Nights themed picture. It is beautifully cut and assembled, but it is another of those pieces we are unable to provide any further information about. Our opinions are only our own assumptions we're afraid. But hopefully you can put us wise where such superb pieces as these are concerned. Click the above button to return to page 46 of "Can You Help"